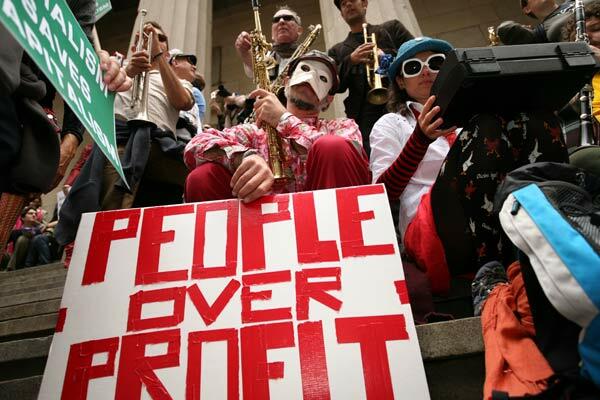 America Revealed: Communists Are Taking Over Wall Street? Several sites have labeled the movement as a communist one by picking out of the crowd, people holding signs advertising the Workers World Party : A socialist movement that has had relations with communist organizations. The protestors have been en masse, categorized as communist for the company and signs of only some in the crowd as well as labeled anti-American by others. Some of these same people who are making this claim have themselves defended alternate movements such as the Tea Party protests where some members held signs of our President as a socialist clown as well as some having signs with racial slurs on them by saying they were not part of the rally. But now, a movement against the corporatists who have largely been responsible for our economic troubles is somehow communist in its nature because some held up signs from a socialist group. Maybe they were not part of the rally. The real issue though, is the purposeful delivery of a clear message by our corporate representatives that dissent will be met with violence without bias. The protection of Wall Street by a police force that once served the people is terribly disturbing. The rationale given by the NYPD, is how the protesters were not occupying the proper “free speech zones” and were there without a permit. Does his explain why a peaceful protest was met with such disrespectful and violent actions by the police force on the scene? The corporate news media is covering this minimally but only to send a message that any protesters or those supporting them will be labeled as communists, Marxists or Liberal extremists in order to keep the rank and file members of our society from joining the fight. The proper term for this is PsyOps: Psychological Operations meant to keep the masses in fear while our Nation continues to be plundered. This is just the beginning. But rest assured, the Police State is ready. For years now, a force has been growing in anticipation of these very protests to control an increasingly disenfranchised population that will inevitably become more and more dissatisfied with the growing disparity of income and the elimination of social protections in exchange for Wall Street profits. FEMA camps have been built, Police forces across the nation have invested in heavy armored vehicles, stronger tasers and new Laws have been passed to charge protesters with Civil Disobedience among other fabricated crimes. Thomas Jefferson once said that the Tree of Liberty must be refreshed from time to time with the blood of Patriots and Tyrants. Hopefully it won't come to that but given the reaction from the New York police state and corporate media (or lack there of), the chances of a peaceful, blood free reconstruction is highly unlikely. For now, we can only hope that Washington will get the message before it comes to that.